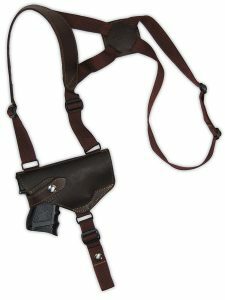 Maybe you, or someone you know, has had a hard time with finding the right left handed shoulder holster. Heck, finding anything for lefties is hard enough as it is. Being that southpaws make up roughly 10% of the population, they tend to be an overlooked minority. What, then, would be the best shoulder holsters for them? 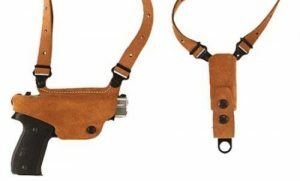 While some holster manufacturers make their holsters available for left or right handed people, shoulder holsters can tend to be a little harder to find such variety. 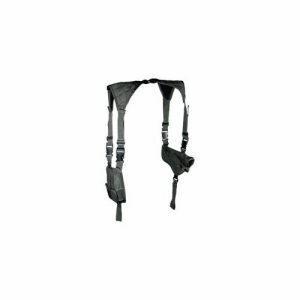 That’s why we wanted to make it a little easier for you by providing a list of the top shoulder holsters we find. To start, our favorite is the Galco Classic Lite Shoulder Holster. Galco is a leading brand in the holster business so of course they would offer a good shoulder holster with the option for both lefties and righties. It is made of top quality material, tested over time for durability, and is utilized by military and law enforcement as a trusted product. Before we move on to the rest of the list, let’s talk a bit about being a left handed shooter. What goes into being a left handed shooter? Is it all the more difficult, annoying, and tiresome as it might sound? Some might think it would be confusing and frustrating, and perhaps at times it can be, but upon inspection it might not be more than the right handed shooter experiences. The amount of lefties in the world used to be as low as just 3% just over 100 years ago. Today, however, that number has risen to roughly 11% and continues to increase through the years. Yes, it can be a pain to be left handed at times. Sometimes you can’t find a product you need, or perhaps it’s difficult for someone to teach you anything when they are most likely right handed. Everything is opposite, but sometimes that doesn’t seem to be enough. Before you get flustered or discouraged, read on to see how you really aren’t at a disadvantage. Everything is backwards for a lefty. When they are face to face with a right handed person, it is a mirror image. Lefties generally have to flip everything around and do things opposite or backwards to perform correctly, but it isn’t too bad to get used to over time. Due to the fact that they have to cope with most everything being made for right-handed people, lefties are more likely to be able to adapt to a variety of conditions and situations. Some would say it is even an advantage shooting a semi-automatic as a lefty. The ejection port on the pistol is facing away from a barricade when against one, and thus ejects the cartridge more freely. This helps to avoid the issue of jamming in an instance a right-handed shooter might be leaned against the barricade and the cartridge jumps back in. Isn’t it a little frustrating most things are made for righties? Or perhaps you’ve gotten used to it by now and have accepted your fate as overlooked. On top of that, most training is optimized for them as well. Most guns and equipment are created with a righty in mind, and the training is formed around their abilities as well. For the southpaw, most are going to have to adapt to the ways of a right handed person. But as we said before, lefties are usually used to having to adapt, and thus hold an advantage. This doesn’t mean that there aren’t guns, equipment, or training out there for lefties, but it is more tedious to search out sometimes. While some guns are made for those who are right handed, there are the ones that are more efficient for lefties. It is recommended, if you are left-handed, you use semi-automatic pistols. This is due to the fact that you will have easier access to the safety mechanism and magazine release. On models like the modern Beretta, Browning, and Smith & Wesson, lefties will have a much easier time. Having looked through a few different issues and effects of being a left handed shooter, what are the tips and tricks a lefty should know? While your experience might be different than a right-handed person, there isn’t too much of a difference. While adjustments might need to be made or a little more research executed, if you follow the below guidelines and tips you’ll be just as successful as any shooter. After all, the dominant hand does not determine who is the best of the best! Now let’s go over that list for you left handed shooters looking for a shoulder holster. Keep in mind this is only a compilation of some of our top favorites. You may prefer another product, or you might like one that isn’t the number one on our list. Either way, take a look to see if anything sparks your interest. A quality built holster made with steerhide and an unbeatable system, in our opinion. Galco created one of the most-liked shoulder holsters, and it’s loved by both left and right handed alike. A high quality leather holster made for durability. It is adjustable to fit your needs and comfort, and made to keep your gun retained and protected. It comes in a variety of sized for a vast amount of pistol styles, which is a bonus. 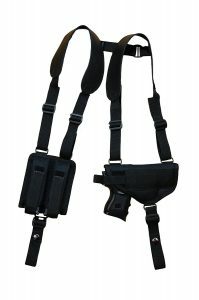 This holster is made for both left and right handed wearers, and has a dual magazine pouch to carry extra with you. If you prefer something other than leather, this is a good option for you. Made of durable nylon material, this holster also comes with a dual mag that is convenient and hardly noticeable. Adjustable up to chest size 60″. Now back to the top pick. While the four we listed in this article all have admirable qualities, we do prefer the Galco Classic Lite Shoulder Holster simply because the design is hardly matched. It fits great, is comfortable, and will last you a long time. While shoulder holsters tend to be slower on the draw, this one was designed for a quicker draw than most which is a plus to us. I hope you’ve found some valuable information in this article, and that you were able to come to a conclusion of what holster you would like. There are a variety of types, though they are limited, but we’ve done what we can to pull together the top holsters we can find. What I’ve found with Galco is that the holster component is right handed no matter how you order it…I’ve ordered 2, and sent one back…modified the other by grafting an Uncle Mikes to the Galco harness…works well. The thumb break is where the issue is…works well for a right handed person…not so well for us lefties. Spend half of the web page moaning about being Left handed. DUMP the crap and get to the subject!